Railway Recruitment Cells (RRCs) invite ONLINE applications from eligible candidates for around 1,00,000 vacancies for the Level-1 RRC Group D posts. like Track Maintainer Grade IV, Helper/Assistant in various technical departments (Electrical, Engineering, Mechanical and S&T departments), Assistant Pointsman, and level-1 posts in other departments. Name of RRC Group D Posts: Track Maintainer Grade IV, Helper/Assistant in various technical departments (Electrical, Engineering, Mechanical and S&T departments), Assistant Pointsman, and level-1 posts in other departments. 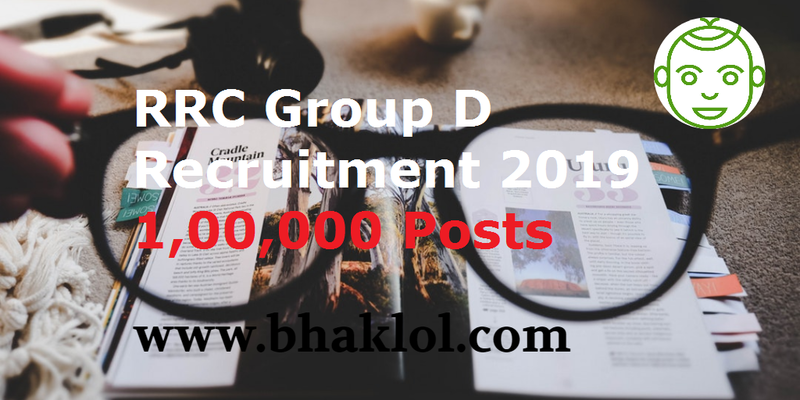 Detailed Notification of RRC Group D Recruitment 2019 for 1,00,000 Posts will be published on 12th March 2019.